THE time was right for Jacinta Kennedy to return to her basketball home. 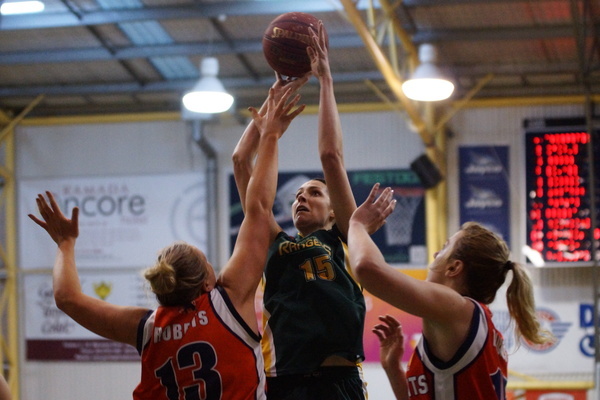 Kennedy (nee Hamilton), 33, will resume her Women’s National Basketball League (WNBL) basketball career after a 10-season hiatus – returning to the Dandenong Rangers’ roster for the 2015/16 season. The three-time WNBL champion and Commonwealth Games gold medallist retired when she was only 24 to move overseas to support her husband, former Socceroo Josh Kennedy, and his burgeoning professional soccer career and to start her family. With Josh hanging up the boots this year, Kennedy decided she could devote herself to the rigours of WNBL life once again. “I’m excited to get back in the league – I didn’t think it would happen, but I’m really, really happy it has and I suppose I’m a bit proud of myself to get back to that level,” Kennedy said. “I just set myself a goal of having a really good SEABL season – I said I had to have a good season to even consider it. With tall tandem Lauren Scherf and Alex Bunton also in the line-up, Kennedy isn’t sure what her role will be, but is thrilled to once again feature in a Dandenong WNBL campaign and add to her 132-game career. “It’s exciting – we’ve started pre-season… I think we’re two or three weeks in and I’m loving it… really enjoying it,” Kennedy said. “I hope I can be a contributor for the team – my role is probably a bit unknown at this point but that’s exciting and a bit nerve-wracking… I’m just going to push myself as much as I can, and really be a strong contributor for the team. Also joining the Rangers’ roster in 2015/16 will be point guard Amelia Todhunter who left the Melbourne Boomers in the off-season. They join a new-look Dandenong roster under incoming coach Larissa Anderson who was excited to get two exceptional players who will fit into the Rangers’ roster with ease. “Obviously the two of them are phenomenal players, phenomenal people, fit our culture perfectly, work their butts off and will bring a great deal to our group,” Anderson said.